The history of earrings is an interesting one because they have been worn by both genders for millennia. The discovery of a 5,000-year old body in the Italian Alps has shown us that men wore earrings as early as the Bronze Age. 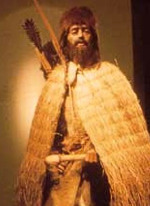 Ötzi the Iceman, as Europe’s oldest mummy is now known, had a 7–11 mm diameter borehole in his earlobe. 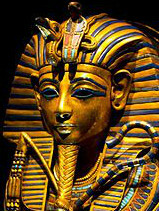 Gilt objects from the tomb of Egyptian pharaoh Tutankhamun (1341–1323 BC), including his death mask, also have earring boreholes. The ascetic and sage Siddhārtha Gautama (c. 563–483 BCE) was born into wealth and power. 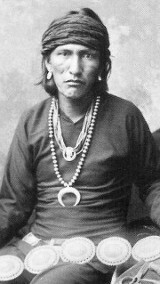 As a sign of status, he wore heavy earrings which stretched his earlobes. At the time of his enlightenment however, the founder of Buddhism discarded all material possessions, including his jewelry. 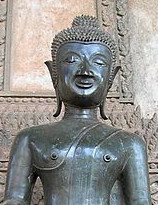 To celebrate his act of self-sacrifice, images of the Buddha are depicted with distended earlobes. Friezes from Persepolis, the capital of the Persian Empire during the Achaemenid dynasty (550–330 BC), show warriors wearing earrings. And in a tradition that spans centuries, the earlobes of male and female babies in India are pierced shortly after they are born. The ancients believed that sickness and evil spirits entered the body through its orifices. An individual could be protected if amulets were worn at these entryways, including the ears. Early doctors also believed that earrings—or the gemstones they contained—cured headaches and improved eyesight. Nevertheless, it is clear that the primary goal was to adorn the body. Earrings remained popular in Eastern jewelry through the ages, but Western tastes proved more variable. Although earrings were never considered unfashionable, at times they were not as popular as other items of jewelry. 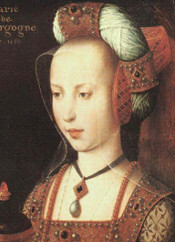 For example, during the Middle Ages, women wore bejeweled headgear and their hairstyles often covered the ears, so earrings became redundant. 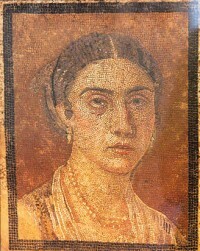 The popularity of earrings returned in the 16th century. Women wore all manner of earrings, but pearl earrings were especially popular. 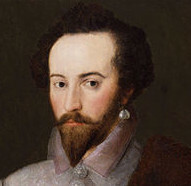 Men—including Shakespeare, Sir Walter Raleigh, and Francis Drake—also wore gold rings and other ornaments in their ears. Among seafaring men, a pierced earlobe meant a journey around the world or across the equator. Survivors of shipwreck wore an earring in the left earlobe. 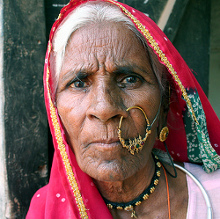 In the early 20th century, it was considered improper to pierce the earlobes. Instead of eliminating the use earrings altogether, screw-back earrings were invented. Screw-back and clip-back earrings remained popular with women until piercing came back into style in the 1960s. During the 1980s, men once again embraced this ancient fashion. Today it is no longer shocking to see them wearing earrings. Perhaps this explains why piercings have become increasingly elaborate. Needless to say, today’s ear-piercing techniques and equipment are very different from taking an awl and running it through the ear into a door. But in other ways, things have come full circle: borehole sizes once again approximate those sported by Ötzi some 5,000 years ago.